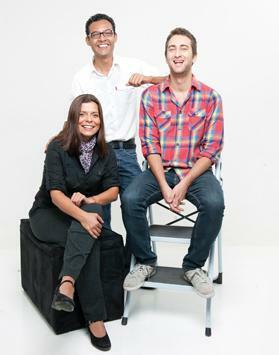 Left to right: Giannina Segnini (project manager), Rigober­to Car­vajal (data scientist) and Matthew Caruana Galizia (developer). A young Maltese man is one of a handful of journalists and web developers who helped to create Offshore Leaks, an international database exposing secret companies and funds in offshore tax havens. Matthew Caruana Galizia, 27, translated “big, very poorly constructed databases” into graphs that show the connections of every person or company involved. “We then took that structure and produced a web application that anyone can use to search and explore it. I did the majority of the work in that area,” he told Times of Malta. The database includes a number of Maltese names, companies, trusts and funds with connections to offshore tax havens. Mr Caruana Galizia, the eldest son of columnist Daphne Caruana Galizia, previously worked in web applications at the Financial Times and got involved in the project after attending a technology and journalism conference in London. The work began two years ago when a hard disk containing 2.5 million files was delivered to Australian journalist Gerard Ryle by an anonymous whistleblower. The files turned out to be internal documents from Portcullis TrustNet (PTN) and Commonwealth Trust (CTL). “These are agencies that provide a kind of turnkey service to anyone wanting to set up companies in jurisdictions that are tax havens, allowing secrecy – meaning that sham directors are used to hide the identities of the true owners – or both,” said Mr Caruana Galizia, who worked on behalf of the International Consortium of Investigative Journalists. The database is similar to the controversial leak of US diplomatic cables called Wikileaks but, as Mr Caruana Galizia explained, there are some key differences. “A lot of work went into auditing the resulting database and site. In that sense, there was much more journalistic rigour here when compared to Wikileaks. “The data were checked by a team of journalists from around the world several times over, and the database was refined by professional data scientists, including my colleague Rigoberto Carvajal. “There’s also the fact that, in this case, the whistleblower isn’t sitting in solitary confinement in a US jail, like Bradley Manning,” he added. The leak differs too from the whistleblowing case involving the National Security Agency, especially due to its enormity: 260 gigabytes of data have been leaked. So why should people care about this database? Early investigations by journalists around the world have already revealed many cases of evasion that run almost the whole social gamut, from millionaire bankers to politicians to dentists, Mr Caruana Galizia explained. “Corruption is perception,” he added. “People who suspect politicians and business owners of evading taxes often lose trust in the entire system and find their own ways of dodging taxes. “Eventually, the majority of the population begins to engage in dodging and the whole system collapses, a sort of tragedy of the commons. This scenario is all too familiar in Southern Europe. The most high-profile cases so far have involved government officials and their families and associates in Azerbaijan, Russia, Canada, Pakistan, the Philippines, Thailand, Mongolia as well as other countries. When asked what he and his team hoped to achieve, he said, “The short-term objective is that legislation changes globally and offshore secrecy is abolished. “Using sham directors to register companies makes a mockery of the law and undermines the trust we place in it. “My long-term hope is that societies become more transparent about taxation and governments stop depending on subterfuge to discover evasion. One of the Maltese people whose name crops up most frequently on the Offshore Leaks database is Albert Muscat. An accountant, Mr Muscat runs his own fiduciary accounting practice called Unifin. His name and that of his company appear about 30 times on the database. “The information I found in the database about Unifin and about me is more or less correct,” he confirmed when contacted. “Since the database does not disclose the identity of any of our present or past clients, I have absolutely no issue with it,” he said. He denied he was in any way a sham director and insisted that whenever he or his company were listed as directors of another company, none of their decision-making powers were delegated. Otherwise, the director would have no idea of the decisions made by the person delegated with such powers. “In such cases, the risks are huge and the implications could be far more serious than just tax evasion,” he said. However, he added, such situations were not restricted to offshore jurisdictions but to all companies, irrespective of their place of incorporation.